Kenmore Canister Vacuum bag style: 5055, 50558, and 50557. Also fit Panasonic Vacuum Cleaners that take C-5 Bags. This is a 9 Pack Kenmore/Panasonic designed and developed by eVacuumStore.com. This Kenmore vacuum bag fits the Kenmore style: C, Q, 5055, 50558, and Panasonic C-5 canisters. This is a 2-ply yellow paper Kenmore canister vacuum bag with an anti-microbial lining inside to protect against asthma and allergy irritants. 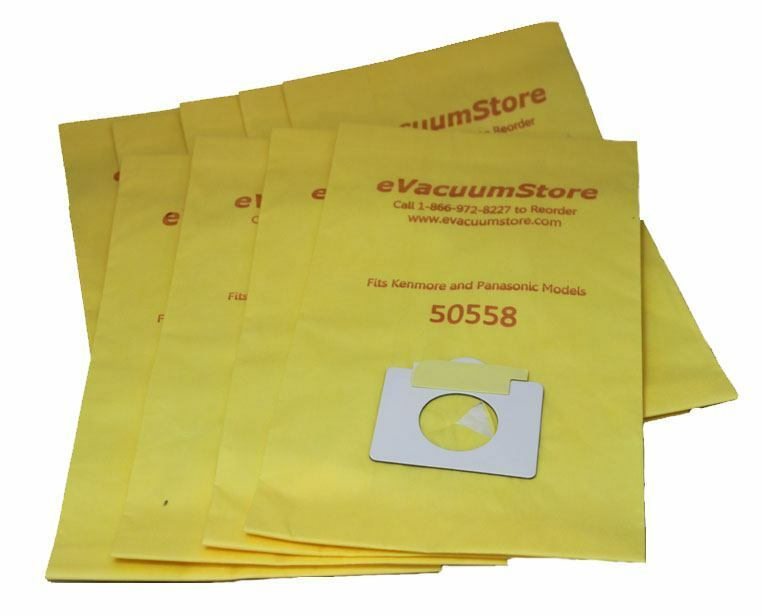 These Kenmore Vacuum Bags are used in the Kenmore Progressive canister vacuum models. Much, much cheaper than ordering thru Sears. Have only tried the item once...it seems to work quite well. Item received quickly. Price was extremely reasonable. Tried one and it fits my older vac so that's great. Just got them so can't comment on how the bags perform over time/as they begin to fill (will they break or become too big or not filter well?). On sale, great price. There was a holiday discount code on the website but it did not work during checkout. Called CS and the representative tried but it wouldn't work for him either. Low price anyway so not a loss - I'm happy with the purchase so far. Easy, fast delivery, great deal, bags are not the fabric "factory" type which makes absolutely no difference. These are hard to find, this is a great deal. Answer:Yes, these are the correct bags for that model. Answer:Yes this is the correct bag for your model vacuum. Answer:This is the correct bag for your model vacuum. Shipping can be calculated in the shopping cart. Answer:Yes, these are the correct bags for the model 116.29319215 vacuum. Answer:Yes, these bags will fit your Kenmore model. Answer:For your model, you will need Kenmore style M bags which we have available. Please call 866-972-8227 to order the correct bags. Answer:According to the model number provided, you will need Kenmore Style E bags. Answer:Yes, these bags will fit your model vacuum. Answer:These bags will fit that model. Answer:Unfortunately, these bags will not fit that model. Answer:These bags will fit your Kenmore model. Answer:Sorry but Kenmore does not provide a specification of how many quarts these bags hold but it probably close to 5 quarts. Answer:Yes, these bags will fit. Answer:Yes, these bags will fit model 116-29512991. Answer:Yes these bags will work with your model vacuum. Answer:Yes these bags will fit Kenmore model 116.23312302. Answer:You will need to open the top cover and then insert the bag into the bag holder. Answer:Yes, the Kenmore C bags will fit model 116.21514012.